I just reviewed the new Smelly Web Index data which the Stat Monkeys popped into the pneumatic delivery tube earlier this morning, Over the last eight weeks one result is blindingly obvious: there is no trend. The chart lines for the three indexes look like a layer cake. 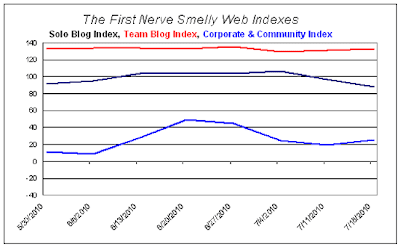 The Team Blog Index is on top, gliding along between 130 and 134; the Solo Blog Index is in the middle, oscillating between 88 and 107; and the Corporate & Community Site Index is the more variable bottom layer, bouncing around in the 8 to 50 range. Sure, individual sites on each index have had their ups and downs; but the overall rankings are pretty steady and therefore pretty boring. I haven’t been able to squeeze a lot of news out of them. It’s not much fun to write about and, yes, FirstNerve’s ongoing slide (-35% this week alone) takes away some of the zest. I’d rather be writing about science and the cultural scene. 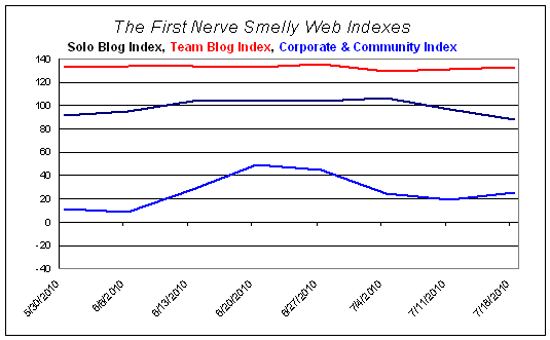 So for now, the Smelly Web Index weekly report goes into mothballs. The Stat Monkeys—chained to their computer screens in the data vault—will continue to record the numbers in return for their usual minimal ration of bread and water. I’ll post an update whenever something newsworthy happens. I may also post special reports highlighting the performance of one fragrance blog at a time. We’ll see. Th-th-th-th-that’s all for now, folks. That's right. Sundays are for Bloody Marys with brunch, not angst. If the smelly blogosphere goes crazy, I'll post something about it. Ah, the tricky winds and treacherous currents of the Alexa Triangle. One moment your spinnaker is straining like Pamela Anderson's brassiere, the next minute you're becalmed. Not to worry--we give the Stat Monkeys a Jolly Rancher whenever they spot a statistical change in your trend line. You'll be the first to know.